Proceed Innovative is a certified Google Partner that helps businesses improve their online presence and traffic through proven SEO strategies and effective web design services. Our clients experience drastic improvements in their website’s rankings and traffic which results in more leads, boosting the ROI of their website. This case study of our client Furniture Medic by MasterCare Experts is one example of how we help drastically improve traffic, rankings, and quality sales leads for our clients. Furniture Medic by MasterCare Experts is a furniture medic franchise in Carol Stream, IL that services much of the western Chicago suburbs. Their expert craftsmen provide furniture restoration and repair services and deliver the type of high quality work that has become synonymous with the Furniture Medic name. Despite their dedication to quality work and excellent customer service, they were not getting many leads through their website and felt that they were losing potential business due to poor online presence. Proceed Innovative has since boosted their online presence with a new website design and proven SEO strategies, increasing their average of 2-3 leads per month to 60 leads per month. When Furniture Medic by MasterCare Experts became a client of Proceed Innovative, they only averaged about 2 to 3 leads per month. One of the first ways we helped them was by building micro-sites for them on our lead generation website, RestorationMasterFinder.com (RMF). The micro-sites that we build for RMF are geo-based to cover the main service areas of our clients and they include multiple service pages to help draw local search traffic and increase the number of quality leads. These service pages are highly optimized to appear near the top of the search results for relevant searches done within the service area. Proceed Innovative has built several micro-sites for Furniture Medic by MasterCare Experts to cover Carol Stream, IL as well as important cities within their service area such as Naperville, West Chicago, Aurora, Glen Ellyn, and others. With our proven SEO and SEM methods, these highly optimized micro-sites helped generate more phone calls and increase the number of monthly leads. In addition to building RMF micro-sites for Furniture Medic by MasterCare Experts, we redesigned their website with a fresh, mobile responsive, user and SEO friendly design. When Furniture Medic by MasterCare Experts became a client, they had an out of date website that had low search rankings. The way their old website was built also made it nearly impossible to make any updates. We built them a new website with a completely new design, user friendly navigation, and mobile responsiveness so that it will display properly on any mobile device. Since launching the new website in October 2014, the rankings and traffic have steadily grown every year. Furniture Medic by MasterCare Experts now averages about 60 leads and more than 30 submitted forms per month from their RMF micro-sites and website. Mobile Friendly: More online searches are being done on mobile phones than any other device and if a website doesn’t load properly on a smartphone or tablet, most users will immediately leave. The website for Furniture Medic by MasterCare Experts is mobile responsive so that it will display and function properly on all mobile devices. Users can browse their entire website from their devices as well as call the company or submit a form. Submit Your Project: The Submit Your Project feature is unique to the website of Furniture Medic by MasterCare Experts. 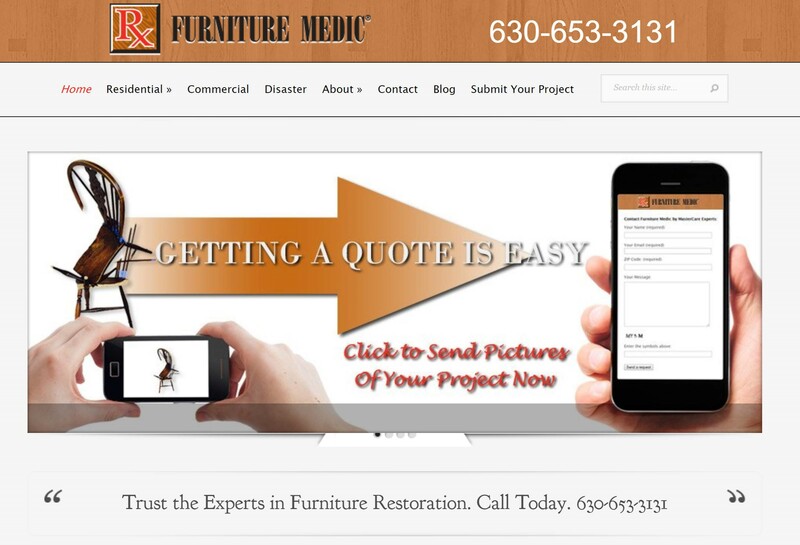 This feature allows customers to submit a picture of the furniture piece they want repaired or restored, along with a form with their contact information to receive a quote. Mobile users can submit pictures and the form via text messaging for a quote. Stain and Paint Colors: Another unique feature of this website is the Wood Stain and Paint Colors page that shows the different stain and paint colors they have available. This allows their customers to easily choose from the stain and paint options for their furniture. Before and After Gallery: In this before and after furniture restoration gallery, users will find examples of the projects that Furniture Medic by MasterCare Experts has completed for their customers. 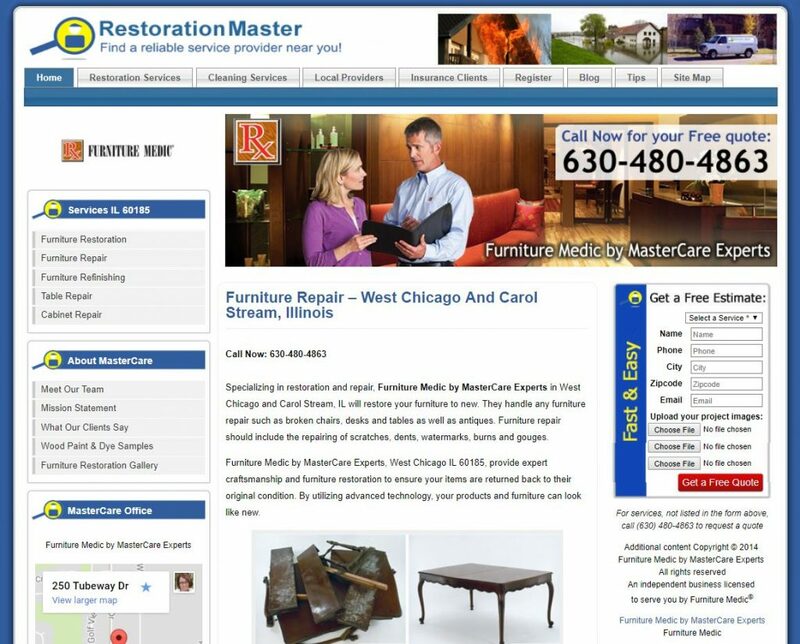 The combination of sound SEO and SEM strategies, optimized micro-sites on RestorationMasterFinder.com, and a newly redesigned website with unique features helped drastically improve the number of monthly leads and form submissions for Furniture Medic by MasterCare Experts. If you want to learn more about how Proceed Innovative can help improve the online presence of your business through effective web design and SEO strategies, visit our website or give us a call at (800) 933-2402.